The fourth Men In Black movie is slowly but surely making its way into existence, despite lacking any input from former franchise stars Will Smith or Tommy Lee Jones. (Or even the 21 Jump Street guys—remember when that was a thing?) 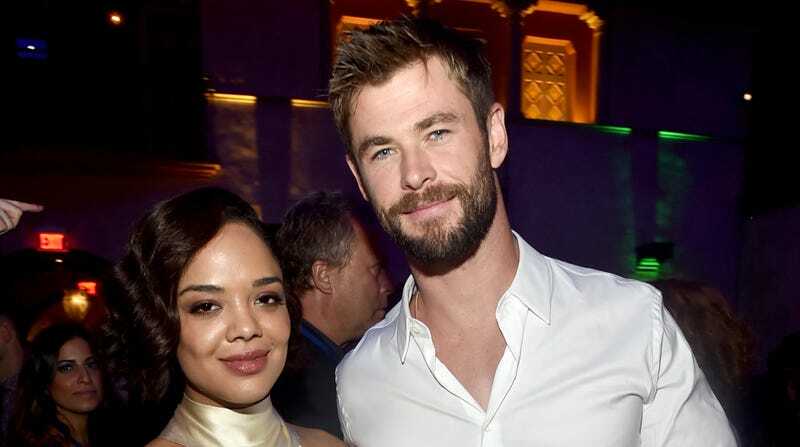 What it does have in its corner, though, was made abundantly clear today, when stars Tessa Thompson and Chris Hemsworth showed off a quick shot of themselves dressed up in the last suits they’ll ever own—or at least the last dress shirts and ties. The Thor: Ragnarok co-stars are pretty obviously the biggest draw MiB has going for it, and we’re not going to lie: They make this look good. (Even if the “this” in question includes duck lips, which we’re not sure are standard Earth-protecting protocol.) Honestly, the biggest danger here is that F. Gary Gray’s film might end up stretching audience disbelief by expecting us to buy the idea that even complicated brain-erasing alien technology could fully wipe out the memory of seeing two of the world’s most distractingly stylish people running around, tiny laser guns in hand.